Differences in the content and organization of DNA, collectively referred to as structural variation, have emerged as a major source of genetic and phenotypic diversity within and between species. In addition, structural variation provides an important substrate for evolutionary innovations. Here, we review recent progress in characterizing patterns of canine structural variation within and between breeds, and in correlating copy number variants (CNVs) with phenotypes. Because of the extensive phenotypic diversity that exists within and between breeds and the tantalizing examples of canine CNVs that influence traits such as skin wrinkling in Shar-Pei, dorsal hair ridge in Rhodesian and Thai Ridgebacks, and short limbs in many breeds such as Dachshunds and Corgis, we argue that domesticated dogs are uniquely poised to contribute novel insights into CNV biology. 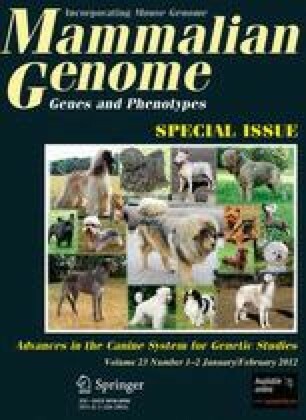 As new technologies continue to be developed and refined, the field of canine genomics is on the precipice of a deeper understanding of how structural variation and CNVs contribute to canine genetic diversity, phenotypic variation, and disease susceptibility. The authors acknowledge members of the Akey and Alvarez labs for critical feedback on the manuscript. The authors thank J. Rowell for critical reading of the manuscript and L. Rybaczyk, C. Bartlett, and L. Hou for technical assistance. This study was supported in part by a research Grant (1R01GM076036) from the National Institutes of Health to JMA, and by a research Grant (R210602710) from the National Institutes of Health and funding from The Research Institute at Nationwide Children’s Hospital to CEA.